For this card I used two of my favorite Stampin' Up Christmas sets; A Wish for Peace and Season of Joy. The image was stamped on Watercolour paper with Black Stazon and coloured with markers (Old Olive, Ruby Red, Summer Sun and Bordering Blue). I added some Elegant Eggplant and So Saffron to the sky with an aqua painter. The cardstock is Elegant Eggplant, Old Olive and Very Vanilla. I stamped the swirls in gold encore ink and added some dazzling diamonds to finish off my card. This is a quick and easy card using the Berry Christmas stamp set. I really like using the moveres and shapers dies to mat the punches. The colours on this card are Old Olive, Real Red , Bashful Blue (sponging) and So Saffron. This little snowman treat ornament is made from a 3" x 3" envelope. You can fill it with treats or a gift card and hang it on your Christmas tree. 1. Seal a 3" x 3" whisper white envelope and cut the top off. 2. Fold the two bottom corners to the back and glue (or use sticky strip) to hold in place. 3. Make a hat band 6.5" long from a scrap of cardstock or Designer Series Paper and attach it to the top edge of the envelope. 4. Cut an orange triangle, fold it in half and attach it to the face with a glue dot. 5. Punch two eyes using the 1/2" circle punch and highlight with a white gel pen. To make the grey shadow use a blender pen to pick up some white gel and draw in a shadow at the bottom of the eye. 6. Draw on the face with a Black Stampin' Write marker and add some pink to the cheeks with a sponge daubler. 7. Punch 2 holes in sides of the hat band and insert a wire (I added some beads from the Pretties kit to the wire before inserting it). 8. Attach some ribbon to the bottom edge of the envelope with sticky strip and tie the ends in a knot to form a scarf. It doesn't show in the photo but I frayed the ribbon ends to they looked like tassles on the scarf. Now you're ready to fill it and hang it in your tree. The bling doesn't show in up the photo but there's a trail of dazzling diamonds under the sleigh and reindeer and the dots between the snowflakes are stamped with Bitty Backgrounds and embossed with Iridescent Ice. The penguin is made from Su punches and the snowflakes are from the Christmas Punch set. I have several of these little ornament albums hanging in my tree. Just slide the lid up the string to reveal the photo album inside. I add a little tag with the year, jounaling and some photos of some of the year's highlights. They're fun to look at each Christmas. I also make a pink or blue version as a gift for "Baby's first Christmas. You can download the instructions here . This project was a remake of a workshop wow I presented at a demo meeting 3 years ago when I first started as a demo. At the bottom of this post I added the samples I made for the meeting as well as the directions I drew up and scanned (yikes). My computer skills are still NOT great but I guess I've come farther than I thought. To personalize the ornament box, print it on a sheet of vellum and emboss it with embossing powder as soon as it comes out of the printer while the ink is still wet. With the new MDS this opens up a whole world of possiblilities. I always find it difficult to make one layer cards. I coloured the leaves on the tree with markers to look like lights and added some dazzling diamonds after it was stamped. I masked the moon and sponged some snow drifts with tempting turquois then added some dazzling diamonds to the snow drifts. The tree is from Thoughts and Prayers and the Sleigh is from Wandering Words (love that set)is stamped in Soft Suede. If you've been on my blog before you may have noticed I LOVE punch art. The new ornament die makes perfect heads so I couldn't resist making a couple of snow kids. I used Whisper White craft ink to stamp snowflakes from the Delightful Decorations stamp set and removed stones from the small rhinestone brads to use in the centres. I used faux snow on the ground and snow balls. The tree and sentiment on the inside of the card is from the Season of Joy stamp set. 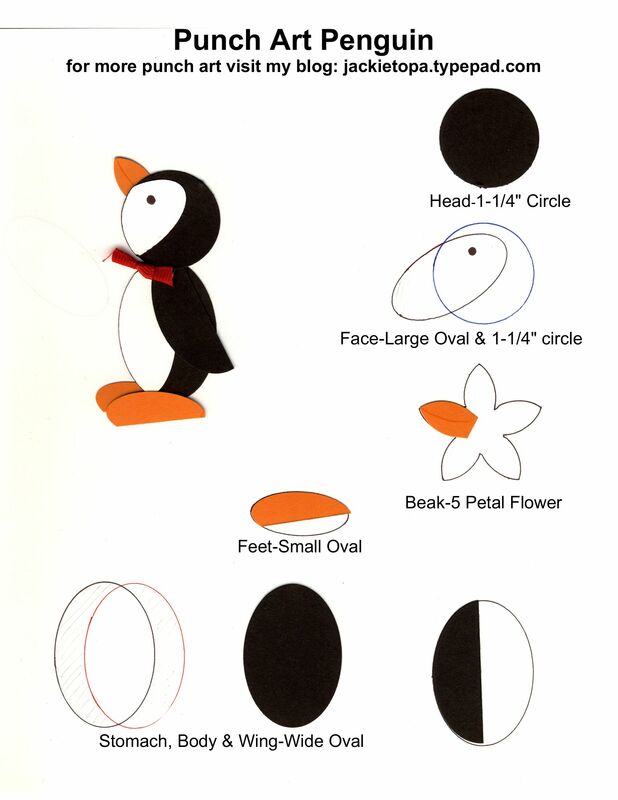 The characters are made from the following SU punches: head-ornament punch, hat-ornament punch & wide oval, hair-scallop oval, arm-small oval, body-wide oval, legs-modern punch, feet- heart to heart, mittens-heart to heart & 1/2" circle, snowball- 3/4" circle. Cardstock sizes: Real Red 8.5" x 5.5", Black, 4"x 5.25", Bashful Blue 3.75"x 5", Bashful Blue (inside) 5.25"x 8.25" and Whisper White 5"x 8" scored 2" on each side of centre line. This punch art puppy is made from Stampin' Up punches. The dog house card folds at the top. I attached the green roof to hide the fold. Head-1 1/4" circle, face and body-wide oval, legs and feet small oval, ears and eye patch-word window, grass-small star, name sign and bone-modern punch. I filled these Santa pillowbox ornaments with treats to hang in the Christmas Tree. Cut a pillowbox out of Real Red cardstock. Cut a scallop circle from Whisper White and fold the top over to make the hat band. To make the face, punch a wide oval and 1/2" circle from Blush Blossom. Sponge on some pink for colour. Cut two of the petals from the 5 petal punch to make the mustache.